It's been so warm I can barely remember what it's like to put on a sweater. I'm looking forward to the day my lemon cookie needs a hot tea rather than an iced tea accompaniment. Then I'll pick up my tea, a cookie, and one of these books, and head for the comfy chair. 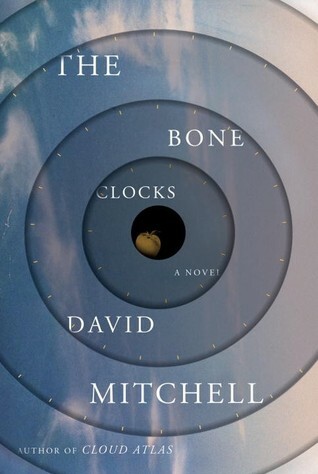 I have a bone to pick with Random House, American publisher of English novelist David Mitchell's The Bone Clocks. Why do we get the kinda boring cover at the right, while the Brits get Sceptre's feast-for-the-eyes cover below? The Bone Clocks has already been long-listed for the Booker Prize, but it must dog paddle across the Atlantic before arriving on our shores next Tuesday, September 2nd. It is apparently very ambitious and the "most Cloud Atlas-y" novel Mitchell has written in the last 10 years. Publishers Weekly's starred review even asks, "Is The Bone Clocks the most ambitious novel ever written, or just the most Mitchell-esque?" Yikes! Sometimes "ambitious" seems to be code for "You're going to have to force yourself to finish it so you can discuss it around the water cooler," but Mitchell's books are invariably interesting even if somewhat maddening. 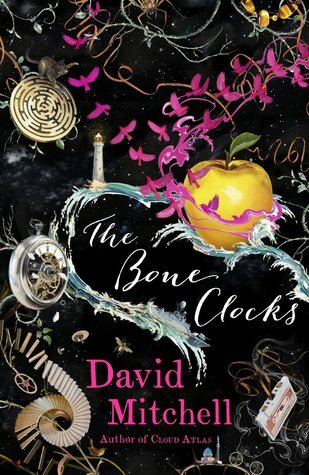 Like Cloud Atlas, The Bone Clocks is long (640 pages), with six overlapping narratives. The story is told by five narrators, including Holly Sykes, whom we first meet as a feisty 15-year-old girl running away from home in Gravesend, England, in 1984. Holly isn't a typical teenager. She has heard voices she dubbed "the Radio People," and she's somehow become involved in a spiritual war between these "soul-decanting" Radio People and the "Horologists" of the Marinus from The Thousand Autumns of Jacob de Zoet, who are trying to stop them. This is a genre-straddling novel of sci fi/horror/fantasy/realism about free will and destiny. By the time it winds down, we've observed Holly for 60 years. It's been a few years since I read Timothy Hallinan's The Fear Artist (see review here). I'm pleased to see the next one in the series, For the Dead (Soho Crime), will be out on November 4th. These books feature American writer Poke Rafferty, his Thai wife, Rose, and their adopted-off-the-streets daughter, Miaow, now in junior high. Life is going well for the Raffertys, and they are preparing to welcome another member into their family. Then Miaow and her boyfriend, Andrew, buy a stolen iPhone and discover it contains pictures of two disgraced and murdered police officers. This discovery jeopardizes the lives of the entire family, since the Bangkok police investigation of the officers' deaths is not on the up-and-up. For their safety, the Rafferty family may need to depend on someone who has betrayed them in the past. The warmth of feeling between these characters and Hallinan's plotting, witty descriptions, and knowledge of Bangkok make this an unusual and appealing series. Don't you love it when you unexpectedly come across something new by a writer whose previous book you enjoyed? Anybody who has ever been involved with house-sitting would appreciate the surrealistic Care of Wooden Floors, by journalist Will Wiles, in which our narrator, a nameless British copywriter, house-sits a gorgeous apartment for old friend Oskar, a somewhat obsessional classical musician. Oskar has notes for Nameless everywhere, but there are three major rules: don't play around with the piano, take good care of the two cats, and don't let anything happen to the French oak floors. Do I need to tell you Nameless breaks all three rules in a terrible, horrible, no good, very bad way? Then things really spiral out of control. 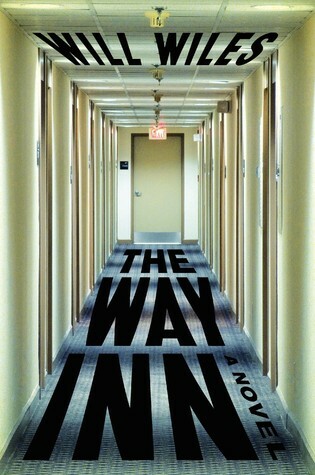 That book is Kafkaesque, and so is Wiles's next, The Way Inn (Harper Perennial, September 16, 2014). Neil Double would have flummoxed everyone on the old TV series What's My Line?. He's a conference surrogate, hired to attend a business conference so someone else won't have to. Wearing a cheap suit, staying in an anonymous hotel room (his favorite hotel brand-name is the Way Inn), listening to boring speakers, and eating tasteless food suits Double's personality and life philosophy just fine, until he makes the mistake of mentioning his occupation to Tom Graham at a Meetex conference about––wait for it––conferences. Graham works for Meetex, and he takes great umbrage about Double's doubling in for the legitimate conference attendee. Double's life assumes the quality of a nightmare. There is no guarantee the answer to his problems is the mysterious Dee, a woman who hints to him about strange secrets in the Way Inn. It's hard to think of a crime-fiction writer more versatile than Donald E. Westlake. He wrote under his own name and several pseudonyms, and his series protagonists ranged from the comic, unlucky crook Dortmunder to Parker, a cold-hearted and violent professional thief. Westlake also wrote screenplays, such as Payback and The Stepfather. When he died at age 75 in 2008, Westlake had won lifetime achievement awards from the Mystery Writers of America and the British Crime Writers Association. And he was still going to his office, where he typed all his manuscripts on his manual typewriter. 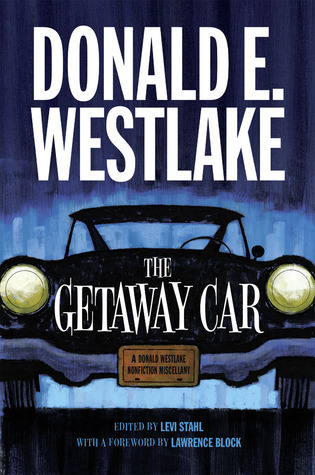 As a Westlake fan, I cannot wait to read The Getaway Car: A Donald Westlake Nonfiction Miscellany, edited by Levi Stahl, with a foreword by Lawrence Block (University of Chicago, September 24, 2014). This is a compilation of material, such as previously published and unpublished essays, pieces from an unpublished autobiography, a history of private-eye fiction, letters, interviews, appreciations of fellow writers, some recipes concocted by his characters, an essay by his wife Abby, and more. Westlake was insightful and funny. Even people who have never read his fiction would likely enjoy this book. 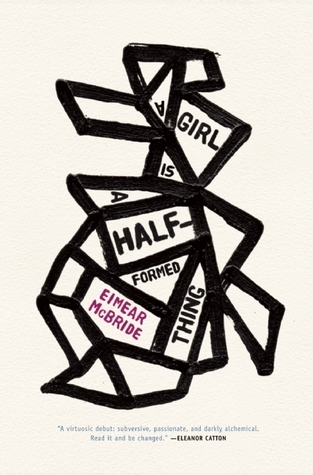 Eimear McBride's A Girl Is a Half-Formed Thing (Coffee House, distributed by Consortium; September 1, 2014) won the 2014 Baileys Women's Prize for Fiction. It's McBride's first novel, and it looks like a doozy. It's about a nameless girl, born into a poor, rural Irish family with an older brother she adores, a very abusive Catholic mother, and an absent father. The brother's operation for a brain tumor leaves him with physical and mental deficits and also deeply affects his family. Suddenly. She's all here mother. She. With scalding prayers. Forgotten her old lash phone calls. Am I not here? I. Give me a good punch on my face. Stop. It's fine now. It's fine now isn't that why you came? To pick up. Bits and pieces. Let her do her thing. Name of the father but shhh. Lead us not into temptation. That's right. All very well. I. So I won't utter a single. No. I will. Do this. I will do this for you because. I can." This book is definitely not for everyone, but it sounds like an unforgettable read. 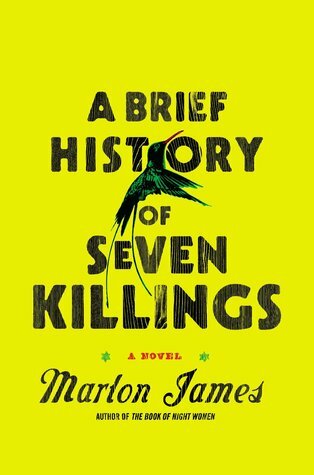 Turn up the reggae music and light one up if you've got one, because I'm going to tell you about Marlon James's A Brief History of Seven Killings (Riverhead Hardcover, October 2, 2014). It's a 560-page epic, set primarily in Jamaica, as well as in New York, covering several decades of violence, poverty, and corruption. Although Bob Marley isn't mentioned by name, one can assume he's "the singer" whose attempted assassination in December 1976 is prompted by a political rivalry. Marley, his wife, and his manager are lucky to escape, and the wounded singer goes into exile in England. The novel's headcount and dozen narrative voices (Marley's isn't one of them) are hardly affected. The major characters are low-level thugs and big baddies, such as hit man John-John K and Copenhagen City gang kingpins Papa-Lo and Josey Wales; politicians from the Jamaica Labour Party (JLP) and the People's National Party (PNP); CIA agents worried about the spread of communism; journalists, including one from Rolling Stone; and Nina Burgess, whom PW calls "undoubtedly one of this year's great characters." Nina begins as a Kingston receptionist, sheds one identity after another, has an affair with the singer, and ends up in New York before the book ends. Mathematicians work their tails off on problems that have stumped their predecessors for centuries, and what happens when they solve them? An outer-space alien from Vonnadoria kills Andrew Martin of Cambridge after Martin solves the Riemann Hypothesis, and then the alien takes Martin's place so all evidence the Hypothesis was ever solved can be obliterated (Matt Haig's The Humans). In Stuart Rojstaczer's The Mathematician's Shiva (Penguin, September 2, 2014), Rachela Karnokovitch, a brilliant mathematician at the University of Wisconsin, reportedly solves the Navier-Stokes Millennium Prize Problem, but then dies of cancer and takes its solution to her grave. Her meteorologist son, Sasha, hopes to bury her with dignity; however, dozens of mathematical geniuses arrive in Madison, and, instead of sitting shiva with the family, do everything they can think of to discover Rachela's secrets, such as ripping up floorboards and holding a séance. Excerpts from Rachela's memoir of fleeing Poland as a child during WWII are shown in flashback. Author Rojstaczer is a former professor of geophysics at Duke, and his book looks like a lot of fun, even for those of us who started formulating excuses for missing homework as soon as our math teachers assigned those terrifying problems with the two trains leaving the station at different times and traveling at different velocities. PW calls Rojstaczer's book "hugely entertaining." Have you read Vikram Chandra's Sacred Games? It's an epic centering around two men: Inspector Sartaj Singh, one of the few Sikhs on the Mumbai police force, and his pursuit of the Indian gangster Ganesh Gaitonde. This 928-page doorstopper even has a glossary of Mumbai slang in the back. It's a great read, and I've been looking forward to reading whatever else Chandra might write. Finally, here it is. 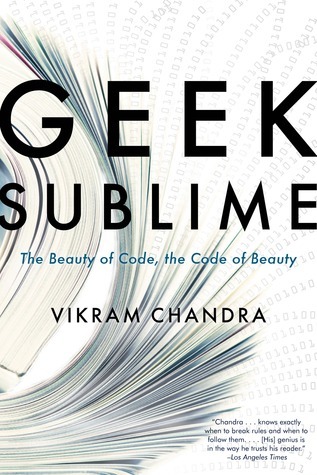 Geek Sublime: The Beauty of Code, the Code of Beauty (Graywolf Press, September 2, 2014) is "part literary essay, part technology story, and part memoir" of traveling from India to the United States and of working as a programmer before becoming a writer. Chandra explores the connections between the worlds of technology and art, and the cultures of code writers and artists. This is a must read for me. Tomorrow we'll take a look at more books Sister Mary is putting on her list for fall. That David Mitchell US cover looks way too much like Maud Casey's The Man Who Walked Away, which was just published this spring. It looks a little like My Life In Middlemarch, too. What's up with the circular cutouts? And in monochrome? I agree, the UK cover is much more fun. 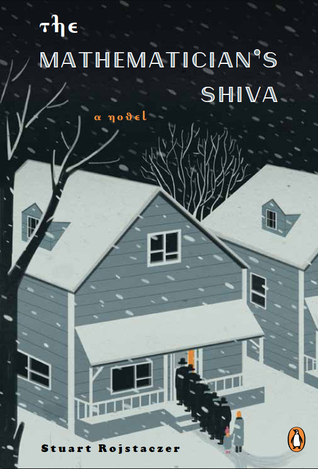 But The Way Inn cover is great and I like The Mathematician's Shiva cover too. I'm wondering if I'll do The Bone Clocks on audio. It's a multiple-reader one, which I tend to like. I know for sure I'll be getting The Mathematician's Shiva ASAP. Sister, you're right. Mitchell's US cover is reminiscent of Casey's cover. Maybe we'll better understand the design/color after we read the book, but it looks a little too tightly wound and monochromatic to be much fun. I wondered if we US readers are supposed to be subliminally reminded that Mitchell wrote Cloud Atlas. Shades of gray and white swirls for that overcast skies look. Doesn't The Mathematician's Shiva sound entertaining? The mental picture of the family trying remain sedate and respectful while a bunch of socially awkward and obsessed mathematicians are tearing the house apart around them made me laugh. I'm sure author Stuart Rojstaczer has been around plenty of mathematicians to skewer them mercilessly. The man's a geophysicist.